This is one of those coolest gadgets that just screams of irony. 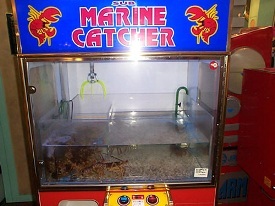 Yes, what you see in the photo is true: the Marine Catcher is one of those claw games that lets you catch a pair of claws. The water on the bottom isn’t there for a challenge, but to protect the prize: a lobster. As far as I know, this Marine Catcher can only be found in Osaka, Japan’s Namba district. I’m not certain how much yen a player has to insert for this crustacean gamble. In case you are wondering, the machine has a plastic bag in case you actually catch one of these lobsters. That’s good, because I wouldn’t want one of these lobsters squirming around in my backpack. This is one of those times in my life where I am grateful to be human. I wouldn’t want to find myself in a trap, then in a claw game, then in a hot tub that kills me slowly as I let out a loud scream. I think the best way I can honor lobsters everywhere is not to take part in this ritual. Also, up until mid ’07 there was a machine like this at the Jacksonville Landing in Jacksonville, FL. I never took a shot at the game, but the deal was that if you caught one it was cooked for you for free at a nearby restaurant. Yes, I had seen something similar like this in a bar back in Kemah, Texas (2002). It was expensive, like 3 bucks a play, but if you caught one then the kitchen would prepare the lobster right there for you; including all the fixins’.